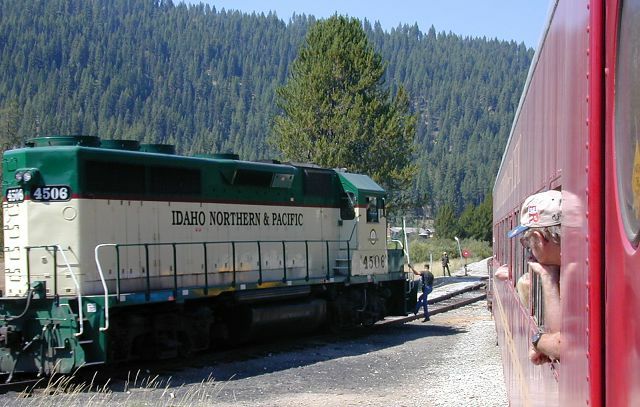 A few of the photos from our outing on Idaho Northern & Pacific's Thunder Mountain Line, from Cascade to Smith's Ferry, Idaho. They also have a run from Horseshoe Bend to Banks, along the main Payette River. 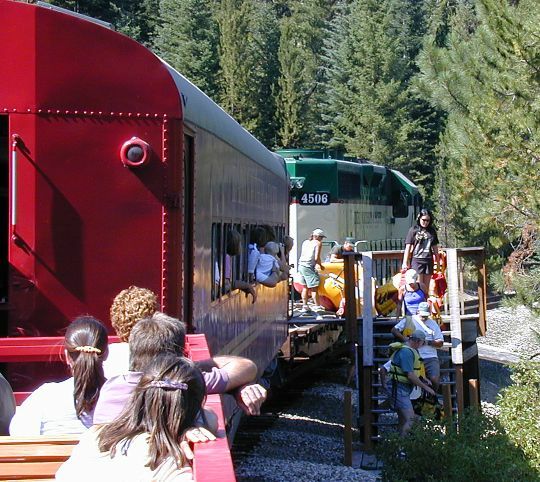 The connecting portion, along the North Fork from Banks to Smith's Ferry is reportedly too steep (2% grade) for their equipment, or perhaps for their rail maintenance. 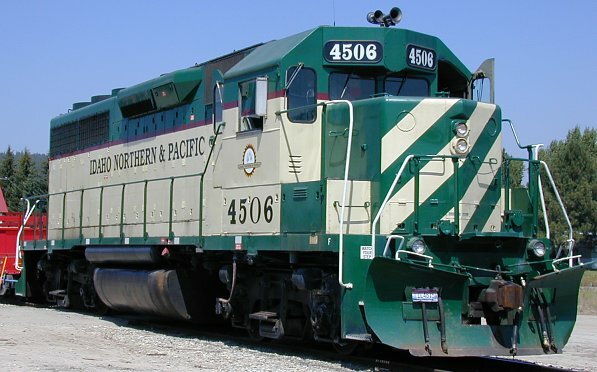 The motive power for the trip is a smartly painted EMD GP-35. 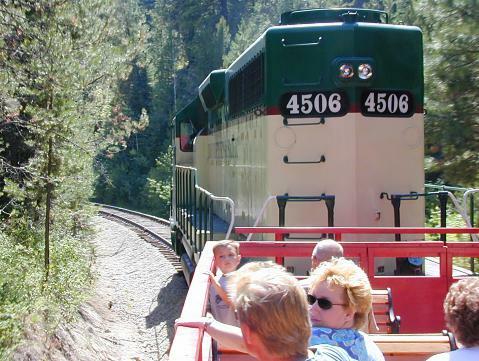 A converted gondola provides the "observation car," with a wonderfully close view of the engine on the downhill leg. Depending on the wind, you may wish that IN&P had tuned up their diesel a little better, but it's all part of the flavor. 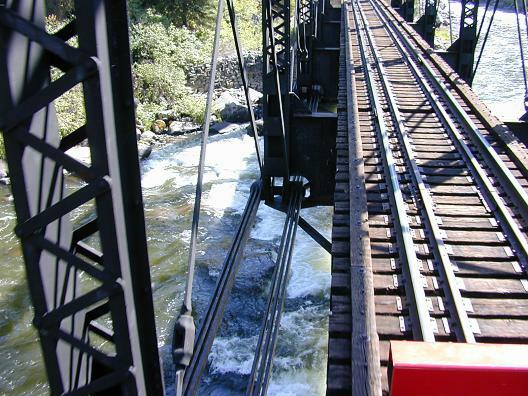 The train crosses the river once, about halfway down the line, on a steel through-truss, built in 1913. It looks like a Warren truss maybe, but I'm not sure, since I was too busy taking pictures while we rolled through it. Underneath the bridge is Trestle Rapids. The upper stretch is shared by the railroad, rafters, hawks and osprey. Everyone seemed friendly enough on the day we were there. On the highway, this bridge is flanked with tight (30 mph) turns, and two narrow lanes. The concrete railings show the abuse of snow, ice and (especially) snowplows. 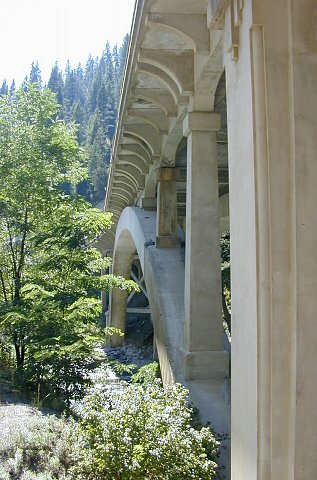 From underneath, it's a wonderful, smooth concrete arch, a graceful leap across the narrow canyon. 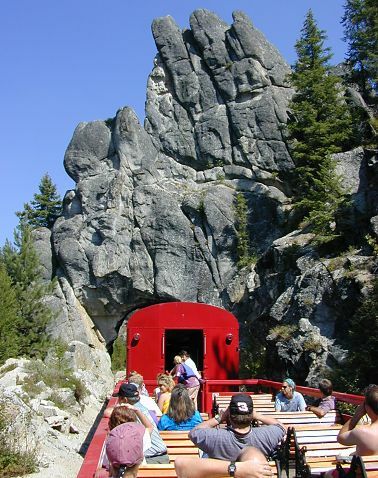 The Cascade to Smith's Ferry section has one tunnel, billed as the shortest tunnel through solid rock in Idaho. The tunnel's built out of the mass of granite that underlies central Idaho, the batholith. Not much for a station at Smith's Ferry these days, but there's a wye, and the engine's uncoupled and shunted around to the flatcar end of the train, while rafters and rafts are loaded on. Headed back upriver, we stop at those odd platforms in the middle of the woods, and unload the local traffic. 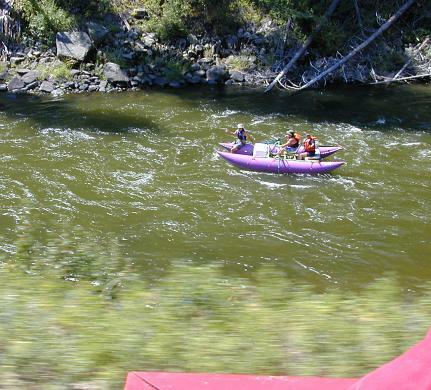 The rafts slide neatly onto a slanted pole platform, and "otter start" down to the river over the grass bank below it. The rafters get a second shot at the rapids of the lower Cabarton. At the end of the line, the train stands for inspection, with free "Locomotive Passes" for those who want to have a look inside, ring the bell, and yes, blow the horn. It must get old in Cascade, 'cause every kid has to give that thing the full-on pull. At my ripe old age, I've been there, done that, and the line of kids was too long for us to wait. Had I waited, I, too, would have wanted to blow the horn. I would have liked to drive it around the wye to the other end of the train, too, but there weren't any passes for that.